I hope this post finds you savoring your final days or weeks of summer. The Hawaii school year, however, starts very early and public school students across the state are returning to school today. Here at Mid-Pacific, we will have new students and high school frosh on campus on Friday and the ’18-’19 school year officially gets underway on Monday! Anyway, that is a long way of telling you that this post is really short because when I am in savoring mode my time management and executive function skills revert to those of a middle school boy (and not even a really academically successful middle school boy… Just a barely passing, shake your head, “Wait, what?”, middle school boy). Anyway, over the last few days, there has been a really wonderful AISL listserv thread about building a culture of reading with students. Wonderful ideas have been shared, but it occurred to me that it would be wonderful to foster a culture of reading with my faculty as well. A few years ago Katie Archambault shared a post on how she runs her faculty book club. I followed her template and have run a very informal faculty book club for the past two years, but I hoped to add something else to our mix. 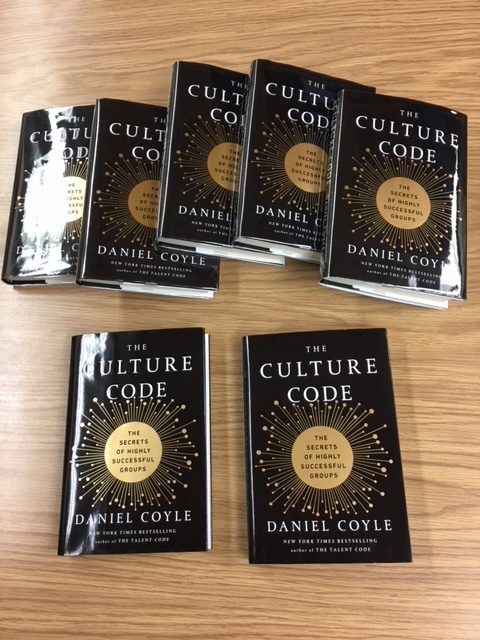 This summer I read and completely loved, The Culture Code: The Secrets of Highly Successful Groups by Dan Coyle. 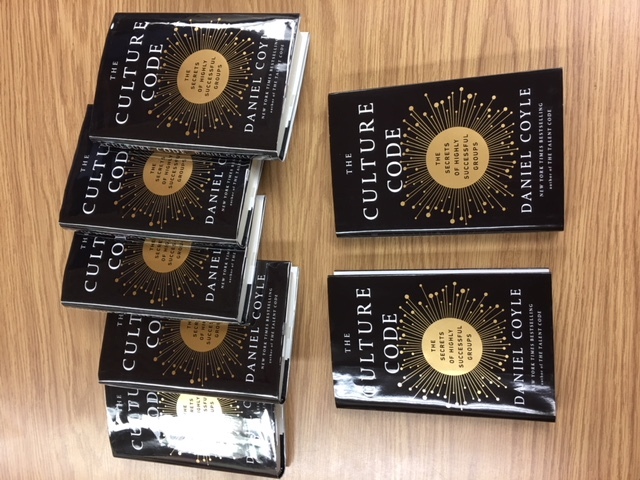 Though written for an audience focused on business leadership, I found the book extremely accessible and easily adaptable to the needs of classroom teachers working to get cohorts/classes of students to work well together or perhaps to administrators, department chairs, or librarians working to get teams of teachers collaborating successfully. 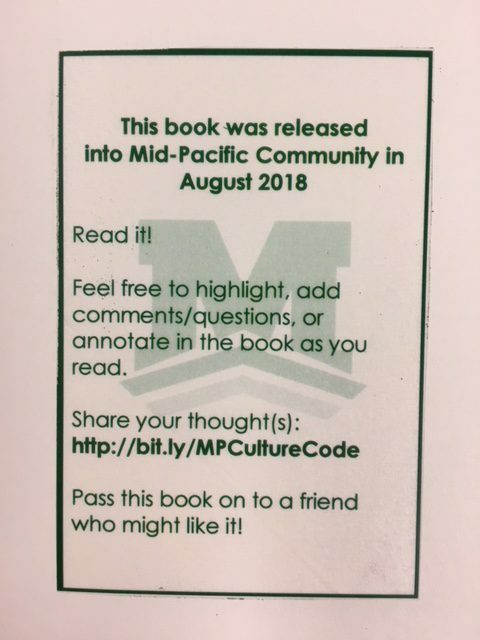 I thought the book aligned so well with our school culture and the philosophy of learning and teaching that we try to foster, that I decided that it would be a worthwhile investment to try to just release the book into the wilds of the Mid-Pacific community and to see what organically emerges. I’ve chatted up the book and dropped them into the hands of people around campus to whom I thought the book might resonate. I simply asked them to give it a read, clarified the information already on the book plate, and left the rest of to them. After just three days, I’ve gotten positive feedback from two of them. Love this idea! I’m the desperate librarian who started the thread about needing ideas for building a culture of reading at my middle school. Yes, I’ve received fantastic ideas and am excited to begin to implement. I’m going to compile repost all the great ideas back to the listserv in a few weeks and will include your “out into the wild” book share in the compilation! Thanks! Your ideas about a faculty book club are so timely. I am just starting a new faculty book club, and between this post and Katie’s, I feel prepared to tackle this fun project. Thanks for the great advice.